Whether it is oak, pine, Laminex, varnished, recycled or modernist glass – in the domestic geography of our daily lives, the kitchen table is a constant. A silent witness to sustenance and solace, deliberation and argument, consolation and celebration. What other piece of furniture has witnessed so much and revealed so little? Here, for the first time, some of Australia’s favourite writers and best-loved foodies share their very personal kitchen table memories, complete with gravy stains, bent forks and the odd tale of love and death. 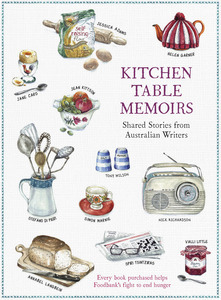 From Denise Scott’s bittersweet recollection of chats around the table with her mother; to Martin Brown’s tribute to the unique and forgotten sport of table climbing; to Helen Garner’s quest to find the table that fitted her home and reflected her life – this charming anthology celebrates a beloved domestic touchstone where our lives, memories, stories and favourite recipes intersect. What’s your favourite kitchen table memory? Your purchase of this book will help put food on other people ’s kitchen tables. A percentage of royalties from each book sold will be donated to Foodbank, Australia’s largest food relief agency.